Wetterhorn Peak is the 49th highest 14er in Colorado at 14,015 feet. It’s located on the Continental Divide in the San Juan Range of the Uncompahgre Forest, west of Lake City. Wetterhorn Peak was named by Lieutenant William Marshall of the Wheeler Survey of 1874, who was apparently inspired by the mountain (although shorter at 12,153 feet) of the same name near Grindelwald, Switzerland. "Wetterhorn" which is German for "weather peak,” is about ¾ mile WSW of the better known Matterhorn Peak, which oddly is not a 14er at 13,590 feet. There are two routes to Wetterhorn, Southeast Ridge (which is the focus of this description) and East Face, and the two share the same path until about 0.4 mile from the peak. I did not see the turnoff to the East Face, so I don’t expect it gets much use. Southeast Ridge stats are 3300 feet and 7 miles from the upper TH; East Face stats are 3300 and 6.5. 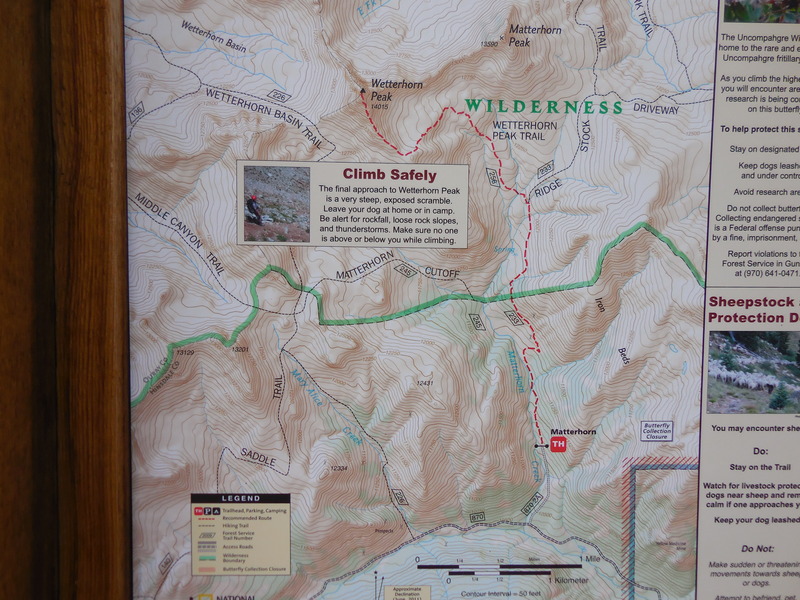 Starting at the upper trailhead (10,800 feet), the trail climbs gradually north along the beautiful Matterhorn Creek for about 2 miles, crossing the boundary into the Uncompahgre Wilderness Area about half way in. Don’t get excited when you see a sharply angular peak straight ahead after emerging from the trees; that’s Matterhorn. Don’t get excited when you see another series of peaks off to your left; those are just the foothills of Wetterhorn. You don’t actually see Wetterhorn until about 1.5 miles in at about 12,000 feet. The route is pretty clearly marked all the way, with signage as you enter the wilderness area and at major trail intersections. The flowers along the way between 11,000 and 13,000 feet are magnificent. After the 2 miles straight north, the trail turns sharply west and crosses a boulder field with lots of marmots and flowers. You eventually climb SW to a 13,000 feet saddle before turning NW straight up the ridge. Here’s where the fun begins. The first part is steep as heck, sandy, and fraught with loose pebbles. It’s hard to even stand up here (a pole is helpful, especially on the way down). The last 500 feet of elevation is pure boulder scramble with nerve-racking exposure if you get off route (and even if you stay on route); however, the rock is good with lots of foot and hand holds. Just keep climbing and you’ll eventually top out on a small flat area not 100 feet across. The views from the saddle, the ridge and the peak are absolutely stunning. Take some time at the top, but don’t linger very long because you are exposed for a long time on the way down the ridge and across the boulder field. We had a bluebird day; hope you do too. We started from the lower trailhead (10,400 feet) just off CR 6 (North Henson Rd. ), where the Matterhorn Creek flows into the North Fork Henson Creek. This added, for us, about 1.4 miles RT and 400 feet of elevation. We were driving a Honda CRV and this was as far as our driver felt comfortable. If you have a true 4WD with good clearance, you can make the upper TH and save a lot of work. Because of Wetterhorn’s isolated location, you won’t see a lot of people or tourists on this peak (not that tourists aren’t people, but... you know what I mean). The people you do see will be serious hikers/climbers out to score one of the finest peaks in one of the prettiest areas of Colorado. 14ers.com is a great resource for Wetterhorn Peak. A good paper map is the National Geographic Trails Illustrated Map “Telluride, Silverton, Ouray, Lake City” #141. Wetterhorn Peak is definitely not a dog friendly peak along either route. If you bring Fido, you’ll spend the majority of your time and a lot of energy lifting and carrying the dog up and down class 3 and 4 terrain. You might not even summit and may endanger yourself and your dog in the attempt. From Lake City, turn west onto Second street. Drive 0.1 mile and turn left onto Henson Creek Road (CR 20). At about 9 miles, turn right onto the North Henson Road (870) and drive a couple of miles to Matterhorn Creek. This is the lower trailhead; park here if you don't have 4WD. Turn north on 870.2A and drive along Matterhorn Creek 0.7 miles to the upper trailhead. The last 0.7 miles to the trailhead requires 4WD - don't take a passenger car up this road.